Who has the best imaginary friend? Is it Gary, who protects the galaxy with Sparky the robot? Or Tiffany, who helps save the day with Awesome Girl? Or Dustin, who can hide Mr. Bob in his pocket? 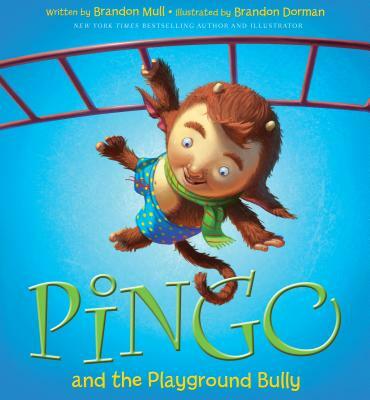 During recess, Chad and Pingo are invited to participate in the contest to see which imaginary friend is the smartest or the strongest or the sneakiest. But when Jeremy, the schoolyard bully, and his imaginary friend, Grunt, barge into the contest, demanding to be included, no one expects what happens next-or how Pingo saves the day. Brandon Mull has worked as a comedian, a filing clerk, a patio installer, a movie promoter, a copywriter, and briefly as a chicken stacker. For a couple of years, he lived in the Atacama Desert of Northern Chile, where he learned Spanish and juggling. He currently lives in Utah in a happy little valley near the mouth of a canyon with his four children and dog named Buffy. Brandon is the #1 New York Times best-selling author of the Fablehaven, Beyonders, and Five Kingdoms series. Visit Brandon at BrandonMull.com. Brandon Dorman is the illustrator of the #1 New York Times bestseller The Wizard. He graduated from Brigham Young University-Idaho, where he studied fine art and illustration. He and his wife, Emily, have three children and live in Washington, where he enjoys working as a freelance illustrator. His work has appeared in children's books and on numerous covers, including The Candy Shop War and the Fablehaven series. See more of Brandon Dorman's artwork at BrandonDorman.com.